At first I was going to skip the half dozen little bridges over the Avon River a little west of Mona Vale Park. I decided to include them, perhaps for completeness or maybe because I'm in competition with Thornton Geoffrey whose book 'Bridging the Gap,' is the definitive work on Christchurch bridges (although now out of print). 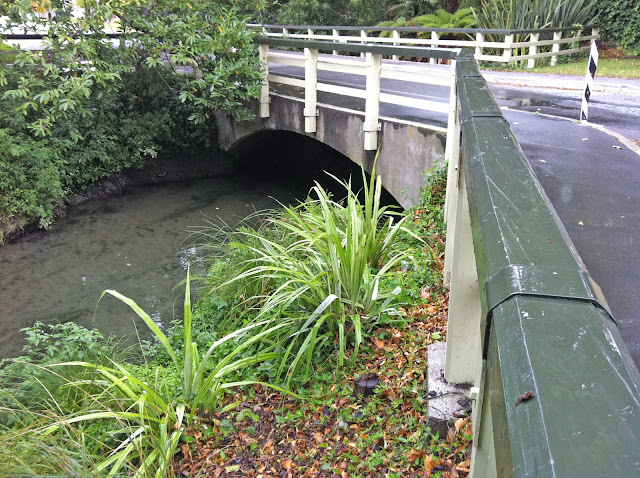 The Harakeke Street Bridge is a little concrete arch culvert in a residential neighborhood. When I googled it, I found several official documents about widening it since there's little room for pedestrians who are being ignored by motorists. The bridge is 6.5 m wide and when two vehicles cross the bridge there are no room for the many pedestrians trying to get across the river. The bridge was built in 1900 and is about 10 m long. New Zealand's Bridges: Harakeke Street Arch Culvert Across the Avon River in Christchurch by Mark Yashinsky is licensed under a Creative Commons Attribution-NonCommercial-NoDerivs 3.0 Unported License.